Do not under estimate what a colony of honey bees is! The success of the colony depends upon many things. Honey bees are capable of democratic decision making! The life and death decisions of these bees depends upon choosing the right dwelling place and location for them to survive. As humans we can give them various kinds of dwelling places called "hives." But will they "adapt and accept what we give them?" Beekeepers often spend a lot of money getting into the hobby of keeping bees. But success is based on the attention one can give to the bees. A package of honey bees is a fragile living organism. The bees in the package may have come from several different hives. [They are shipped from a distant place usually a lot warmer than where you are going to keep them]. They are given a new queen and some how end up in your driveway. They are a product of nature -- over millions of years they have evolved into a social unit called a colony. This social unit requires each individual to contribute to the success of the whole. 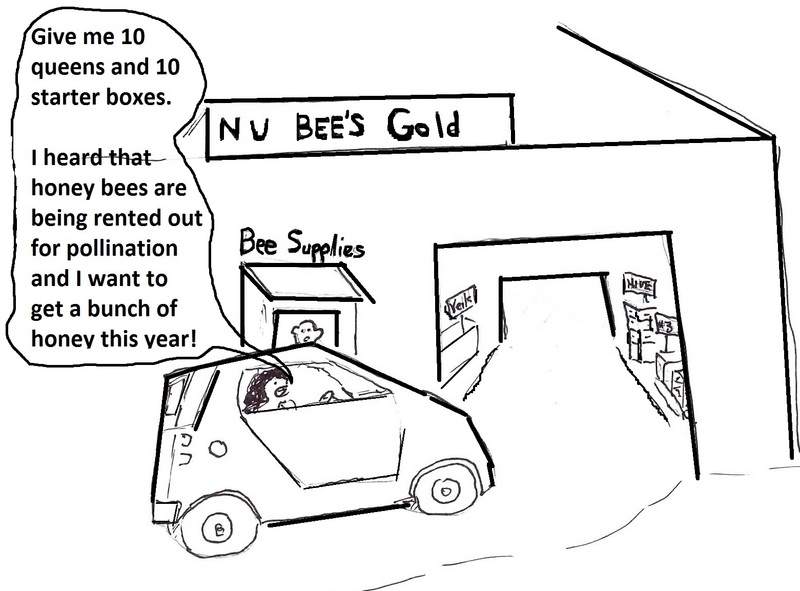 You have a package containing 6000 to 9000 bees that have been removed from the normal natural condition they were accustomed to. Someone is making money by selling an artificial swarm. You have bought a package of bees that may or may not adapt to what you expect of them. Throw out the books because the bees do not read them! Each package of bees is different from another package of bees. Each will require special attention to their need to survive. They will depend on you to provide help to see that they can develop into a normal working colony of honey bees. In human terms getting a package of bees from someone selling bees is like taking your first baby home from the hospital. Unless you have a mother and father there to help you, you are on your own. And in human terms some parents are capable of taking care of the new baby and some aren't. Bee clubs offering a bee school can be of a help but unless they have a good mentoring plan, or you can find an experienced beekeeper to help, you will be on your own. And as humans we give them a queen to accept. The bees in the package will decide if the queen you give them is acceptable or not! I often have heard from beekeepers "why did the bees kill the queen?" Or "why didn't the bees stay in the hive I gave them?" The fact is the bees decide if the hive or queen given to them is acceptable. It is my desire to share with you things that can help you succeed in keeping honey bees. There are things that you definitely can do wrong. Fortunately, the bees will work at surviving regardless of what you may do. First, honey bees need food to survive. It may seem strange that I am showing a picture of worker bees gathering food from a hummingbird feeder. I have a lot of flower pictures but you just brought a package of bees into your world. They will search for food several miles from the hive but they are attracted to nearby sources with high sugar content. Flowers do not compete well with hummingbird feeders. The success of your hive depends upon the food they will be able to gather and they will search every nook and cranny to find it. If the food supply is not enough to sustain your hive they will die unless you feed them. Many new beekeepers assume that the bees will find enough nectar and pollen to survive! Each location for a hive of bees present the bees with challenges: Are there other hives of bees nearby? How far does a bee have to fly to find available food sources? Food sources from flowering plants is variable -- some flower early in the spring and other later. Bees need food for brood production and winter survival. What does your location offer them? Second, the queen must be accepted by the bees and have the characteristics to make the hive successful. The placement of the new queen's introduction cage is critical to her survival. The queen cage must be placed where the queen will be fed and kept warm by the bees in the hive. The new queen must be well mated [If not the bees will supersede the queen (replace the queen given to the bees -- by building queen cells using the eggs available to them from the queen to be replaced). Some report that this is usually a high percentage of introduced queens -- often happening without the beekeeper being aware of it. In fact, it is not rare to find two queens in a hive [the old mother queen and a daughter who will replace her]. I will bet that you read someplace that a hive can have only one queen. That is true for the most part but not always true. A period of time must pass before the queen is allowed out of the cage. The beekeeper must check to see that the new queen is laying eggs after being released from the queen cage. If the queen is mated, released alive and accepted by the bees she will begin to lay eggs almost immediately after being released. [Of course she needs worker cells available to put eggs into]. This is why you want to check on the job the worker bees are doing in building out the foundation in the hive. Many established beekeepers will give drawn comb and maybe a frame of brood to a new package of bees. It definitely gets the bees off to a faster start. They will begin to explore the area around the hive and look for food. Some of the bees will start building wax on the foundation. They will feed and care for the development of the new bees. Time is critical for the bees that came with the package. Their days are numbered and it is up to them to feed and care for the young bees that will develop from the eggs the queen begins to lay. As a general rule, it will take eight to ten weeks for the new hive to reach a bee population capable of sustaining itself. In the meantime, all the bees you bought except the queen will be dead. They will be replaced completely by new bees starting with those that develop from the first eggs the queen lays. The defensive behavior of the bees in your new hive will be determined by the queen that produced these new bees. If the bees in your new hive become aggressive it may be necessary to replace the queen because one characteristic of a queen to be considered is the genetic trait of aggressiveness. It is now time to discuss the drone. A package of bees should not contain many drones. The drone is the male bee in the hive. He is rather unique. He is larger than worker bees -- and a look at his head clearly shows he is different. The eyes occupy most of the head as shown here. He has no father -- he is produced from an unfertilized egg laid by the queen. He does not defend the hive because he has no stinger. He does not collect pollen because he has no pollen basket on his legs as does the worker bee. His sole reason for existing is to continue the linage of his race. The drone mates one time in his life and then dies. The worker bees determine how many drones a hive will raise and how long they will live. The worker bees will build drone cells when needed. But for the hive's survival the worker bees will build worker cells for worker brood to be reared and honey storage. If worker cells are not needed the bees will often build drone comb especially if foundation is not provided to a hive for worker cell construction. There is one other interesting fact about drones -- Varroa mites prefer to reproduce in cells that contain drone brood. But the drone fits in here because of an unusual feature that could occur to your experience in working with a new hive. Sometimes a queen with a package of bees is unable to lay fertilized eggs. It sometimes happens that a virgin queen is selected that did not mate or a queen happens to be poorly mated. In either case the queen might be accepted but the hive has no chance for success unless the bees are able to raise a large force of worker bees. They might raise a new queen from a fertilized egg or the virgin queen has drones to mate with but the time lost will result in lengthy set back. 1) The main reason a new package of bees put into a hive fail is: The beekeeper pays no attention to the new hive or just doesn't know what to look for if something is wrong. The neglectful new beekeeper will know after a month or so, something is wrong. The bees have not drawn comb on foundation -- maybe two or three frames and the bee population is getting smaller and smaller. Once a new hive is recognized as having a problem after two or three weeks it is almost too late to save them. 2) The queen sold with the package is dead on arrival. (DOA) No queen -- no new bees If the hive is to survive, a new queen must be acquired immediately -- not tomorrow -- not next week. 3) The bees leave the hive and don't come back. It could happen. Some beekeepers recommend installing a package of bees in the late afternoon. I am not sure this works. If the bees don't like the hive you give to them they will leave. Sometimes they drift to another hive in the area. Sometimes they fly into a nearby tree and cluster like a normal swarm would. And at other times they just disappear. This is more likely to happen if the bees are hungry. It usually happens within a day or likely soon after the bees are put into the hive. They will even abandon a queen in her cage. Bees seldom abandon a hive with brood. If the queen is dead or for some reason the bees reject the queen -- the bees have a choice of going to another hive with a queen -- expect that as normal behavior. Those installing several package in the same bee yard or apiary will find some packages installed into hives will have drifted (moved) into other hives. Thus the population of bees in one hive may be small and the population in another hive large. There are management techniques that allow the beekeeper to equalize hive populations. My job is to give you information so you will avoid the experience of "start up failure" with your first hive of bees. So I have added this section to show what a normal hive developing over the first month should look like! Words are not the answer here. Pictures say far more than I can. But I will make a comment or two along the way. Without all the frames, a package of bees dumped into a hive may look like this. This was a good package of bees -- at least four pounds of bees. The more pounds of bees to a package result in faster development time. It just doesn't pay to buy a three pound package and split the package into two hives by buying an extra queen. You many have two hives rather than one but it will take the two (1 1/2 pound) groups of bees longer to develop into productive units. If a person waits until the hive has a very strong population and you would like to add another hive you can do it later maybe in July. In that case, both hives will have a better chance of survival. This hive had a problem. All the work the bees did in building the comb in the middle of the hive is not what the beekeeper wanted. Just after the queen was accepted and out of her cage, the beekeeper should have gone back and added frames when the bee package had been removed. Unfortunately the beekeeper had other things to do and just didn't get around to it. This is not the bees fault! 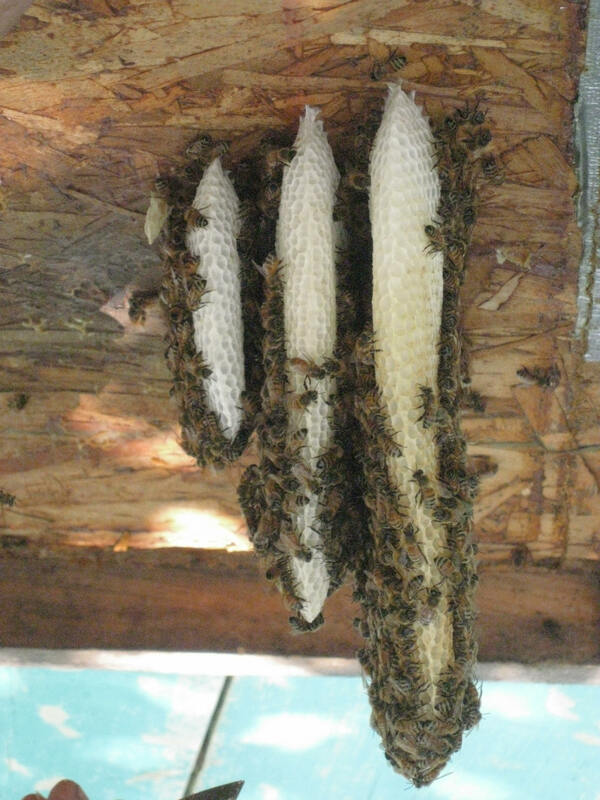 Bees will build comb down from the inner cover or top cover as shown here if frames are missing below. Nice new comb and most likely the queen is among the bees on this comb somewhere. In both cases shown, this is not the fault of the bees. It is what they do! Call it human beekeeping miss-management! So I am often asked this question "How often should I check my hive of bees?" Answer: Often! This doesn't mean you have to open the hive and check every frame. Or check and find the queen each time you open the hive. Taking off the top cover and inner cover to make sure you didn't leave any frames out is important. Just walking by a hive often tells you that something is wrong. There is normal and then there is not normal. If you visit your hives often in a walk by, you will see plenty of normal activity and from that normal activity you will notice anything that is not normal. If you see yellow jackets trying to get into your hive and the bees don't resist, something is wrong. If you have two hives - you will be able to compare what one is doing compared to the other. If one has flight bees coming and going on a steady basis and one is not producing the same traffic -- maybe you should check the hive with the reduced flight activity. But the only way to know for sure what is going on inside your hives is to open them and check every couple of week for things on your check list. It might be that you can pull one frame and get all the information you need to be satisfied that everything seems to be okay. And finally, most new beekeepers do more damage to their bees than anything else. They visit and start pulling frames up and out of the hive. I visited a friend this past year and was horrified in the way the frames were handled. You should start by removing a frame from near the outside wall of a hive. Usually the queen will not be on outside frames and the bee population is less there. Once that first frame is removed, the next frame can be removed with slight pressure from your hive tool to move it away from the frame adjacent to it -- then with a good grip lift it up. DO YOU KNOW WHAT HAPPENS IF YOU DROP A FRAME OF BEES AT YOUR FEET? Some queens are killed by beekeepers that roll the bees between frames as frames are lifted out of the hive. I am sure you want to avoid that mistake. It is easy to crush a queen between frames when putting frames back into a hive. Or if you set a frame down on the ground next to your hive -- what happens to any bee that just happen to be on the frame where it contacts the ground or thing it is placed on. The same applies to adding and removing supers to the hive. There are all kind of activities that could result in the loss of the queen -- This is the reason I say don't pull frames out of the hive to look for the queen. You remove one frame at a time carefully to avoid killing the queen. Back to normal hive development -- I get side tracked often! This is a standard 10 frame hive with medium frames. The bees have clustered and started comb construction in the top hive box. There is a nice population of bees clustered on five frames and because it was warm on the day I took this picture, there were many bees scattered about the hive and some were coming and going from the hive. Hives should be painted to protect the wood and add to the life of a hive body. This can be done when the weather is warmer if time is not available in the spring! Medium hive bodies are very popular with those who want to have only one size of frame. Keeping the hive up off the ground will provide some protection from moisture. Bottom boards are usually the first part of the hive to rot away. This is another hive with medium boxes. 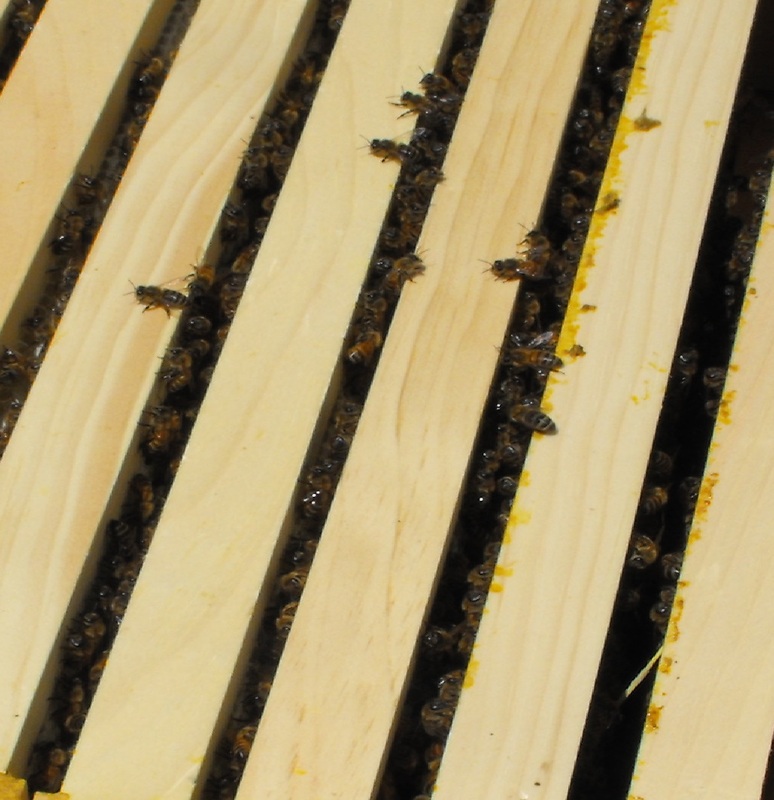 The bees have begun to coat the frames with propolis (bee glue). In time these frames will turn dark brown. This is what the bees in your package should look like when they start building comb and taking up residence in your hive. Bees generally move into the upper box if two boxes are used to get the hive started. They will build downward as the bee population grows and draw out comb in the frames. They begin where you see the cluster and work out and down from there. You can always check on what his happening in the lower box by lifting the upper box as shown. As the bee population grows you will not be able to see behind the hive by looking thru the box. The bees have been in this hive for one week. New comb has been drawn by the bees and the bees are using the cells to store honey above the brood chamber. Again very normal bee behavior. The bees will use this honey for the future needs of the hive. That is unless you take it away from them. This comb has no brood in it. The comb is light in color. Comb will turn dark brown in time if brood is raised in the cells of the comb. Boxes placed above the brood chamber are called honey supers. If you place a honey super on a hive before the frames below it are completely drawn out, the queen may enter this box and start laying brood in it as well. Queen excluders are used to keep the queen in the brood chamber boxes. A brood frame taken from the brood chamber of a newly started hive will look a bit different than frames in a honey super. First, this frame contains some honey near the top bar (top of the frame). And just below the honey the bees are storing pollen and below the pollen the queen has started laying eggs. This frame is from a hive only two weeks old. The bees drew out the comb and the queen began laying eggs in it. You can examine a frame like this and estimate how long the queen has been laying in it. Bees on this frame are just beginning to cap the developing brood. Honey comb is six sided hexagon shaped wax structures called cells. Eggs are small white and oblong. As the egg ages it will lay over on its side. The egg hatch in three days. The larvae take on a worm shape. It takes a lot of bee resources to produce a frame of brood. Bees must gather pollen and nectar. They must draw out the foundation using wax from wax glands on their abdomen to build the comb. It is claimed that it takes a frame of pollen and a frame of nectar to produce a frame of worker bees. As a larvae grows it will fill the entire worker cell. At the conclusion of the larva stage the cell is capped over by the bees. The larvae then goes thru a process of becoming a pupae. The age of a particular stage of development can be determined quite accurately. It takes eggs three days to hatch. The larva stage continues for the worker bee six days. The queen development is a bit shorter and the drone development is a bit longer. The pupal stage for the worker bee is 12 days. A lot is happening to the young developing bee during this time. I have heard it said that the egg can be compared to a watermelon. Imaging a watermelon becoming an elephant in just 21 days. For this growth to occur the brood nest temperature must be maintained at or near 92 degrees F. To accomplish all of this requires a strong work force. The largest number of bees in a newly started hive will be occupied with work involving wax building and brood production. A beekeeper must be able read the information seen on the frame and what the bees are doing. The beekeeper must then interpret what is seen. A knowledge of honey bee biology is important if a person is to understand all that goes on inside the bee hive. Unfertilized eggs laid in these cells will develop into drones. To me the building of drone cells is a good sign that everything is moving along as it should. There is only one case in which I would be alarmed -- if the worker brood is missing or if worker cells are being used to raise drones. This is a complex process and all the bees work together completing different task to make it happen. You can see the capped brood of worker bees in the center of the above picture. Around the capped brood is developing larva. And near the edge will be found eggs that have yet to hatch. When the older brood begin to emerge from the cells, the queen will again visit the area and put eggs in the cells that have been made ready by worker bees given the task of cleaning the cell. Thus, a frame of comb will show this ebb and flow of brood cycles on the frame. The first eggs are laid toward the upper center of the frame and eggs are then deposited radiating outward. Once the adult bees emerge the egg pattern will be repeated with an egg being laid in a cell that was just emptied by a young adult bee. No new bees have been added to your hive population until that first new young bee emerges from its cell. After three weeks and several days, you should begin seeing new bees emerging from cells. Think 24 days if the queen is released from her cage three days after she was introduced to the bees. It takes 21 days for a worker bee to emerge from its cells from the day the queen laid the egg. It takes 24 days for a drone and the queen -- well nature gave the honey bee somewhat of an advantage for survival if a queen dies. It only takes a queen 12 days to develop from a newly hatched fertilized egg. The total development time for the queen is 16 days but in real terms -- if you accidentally kill your queen or she dies from mysterious causes the bees will feed selected larvae royal jelly, The transformation is remarkable because this special food and high food intake leads to increased growth and morphological changes necessary for queen development. After she emerges from her cell it will take a week or more for her to mate and begin laying eggs. The bees selected this larvae to become a queen. Yes, honey bees have the ability to do that. If not fed a special diet the honey bee egg or larva will emerge from a much smaller cell to live about 40 days rather than the several years the queen will live. Notice the difference in how queen cells are arranged on a frame within the hive. Queen cells hang down. 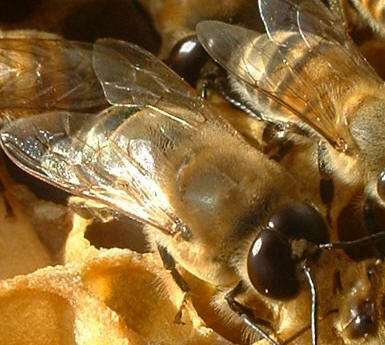 The swarming impulse causes honey bees to build a lot of queen cells. Some say it is natures way to ensure survival of the colony. Worker bees emerge from a much smaller cell as already shown with new bees emerging from their cells. Fortunately, swarming is not going to be a problem with your new hive unless you put them in a single box and do nothing more with them. After bees build up a bee population they may swarm if the hive does not provide room for expansion. When should you add boxes to a new hive? I have always advised that one should only add new boxes above the brood chamber when all the frames have had comb drawn out or started on all the frames in the brood chamber. 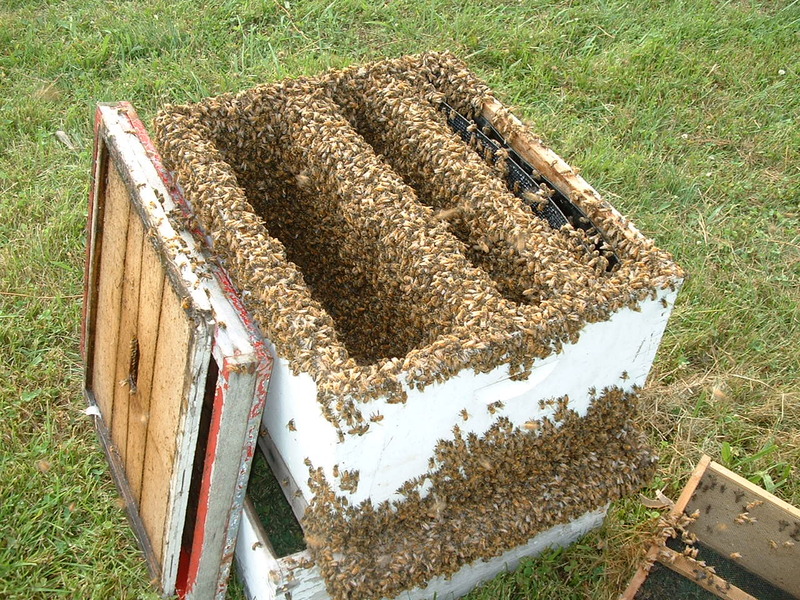 A brood chamber should consist of two deep brood boxes or three medium boxes. But the selection of hive equipment is up to the beekeeper and all of us develop an idea of what will work best for us. Your checklist should include checking the following each and every time you open your hive. Is the queen present and do you see all stages of brood development for worker bees? Are the bees bring in pollen and nectar? Is the bee population growing? Are the bees building new comb and is it time to add another brood box to the brood nest or put a super on for honey storage? Is there anything unusual you notice? Such as bees rushing about making a loud noise when before they were quit and calm. Or you see young larva looking a bit yellow and bee population growth slowing down! Or you see the bees hauling young larva and pupa out of the hive? Or you see bees acting drunk on the landing board -- unable to walk in a straight line! Many things affect a colony of bees. It could be a skunk visiting your hive or a neighbor who has sprayed an insecticide on his apple trees. And yes, bees do get sick from various diseases. That also will be covered in a later lesson. Are they finding food sources? Just remember if the bees are not finding food, the queen will reduce egg laying, and bees will hang out on the hive, and sometimes become more aggressive. A hive that eats all its honey reserves just to stay alive during the late summer will not survive the winter. And as a new beekeeper you will want to see your queen. It is not necessary to see a queen each time you open the hive. If you see eggs and study the pictures of normal development, you can assume things are progressing as they should. But still you might want to see the queen. More important is to check on mite levels and other problems that could become a problem for your hive to survive. Queens in a hive are egg layers. They do not store honey or pollen. They do not defend the entrance. They spend most of their time on frames where brood is located. If you have a hive with two boxes of brood, one box can be removed and set aside on a hive cover. The lower box can be examined for brood. Use just enough smoke to discourage the bees from becoming defensive. And bring another empty box along with you when you start looking for the queen. 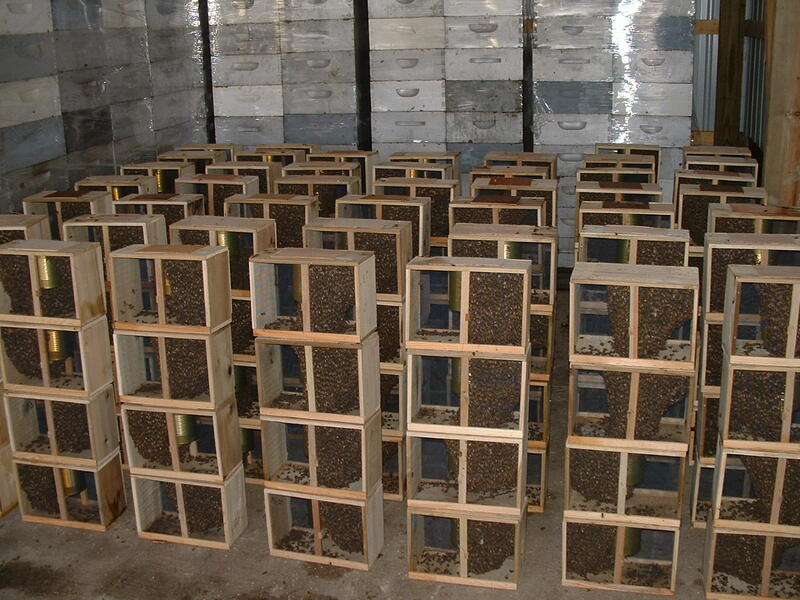 Rather than set frames on the ground or lean them up against the hive body, set the frames in the empty box one at a time as they are examined. Experienced beekeepers know that queens run from light so experienced beekeepers will place two frames next to each other in the box and leave an open frame space before removing another frame with brood to examine for the queen. If you do not find the queen in the bottom box, you can then examine the top box. The bottom box serves now as a space where frames from the top box can be placed as you hunt for the queen. Again look only at frames with brood unless you used too much smoke that cause the bees to start running. Hopefully you will find her. If not, a check of frames set in an empty box adjacent to each other will usually turn up the queen in the area that is not exposed to light. Treatment like this is only necessary when you must find the queen -- such as when you want to replace an old queen with a new queen that has better genetic characteristics. Do not keep a hive open for long periods of time. If you can not find the queen by checking frames twice, close up the hive and try again on another day. Just remember to check for eggs... If no eggs -- then you have a management problem to deal with.